Ladies and gentlemen, it’s football time in Tennessee. Here in the South, we take our college football serious. And why shouldn’t we? We belong to the greatest of all conferences, the SEC. While I was born, raised and will probably die in the great state of Tennessee, I am a Crimson Tide fan. I have to be. My husband is one of the biggest Alabama fans I know and it was just easier to convert than live in a house divided. Plus, I look much better in crimson and houndstooth than in that God awful pumpkin orange of my state’s beloved Volunteers. Brian talks of Coach Saban and the Bama boys like they’re cousins we should expect to show up at Christmas dinner. They are a part of our lives. Our fall weekends revolve around their schedule. Football games are not just about football but tailgating and traditions. We don’t just show up in jeans and a t-shirt on game day. We dress for the occasion, frat boys in their coats and ties, wannabe debs in their game day dresses. This time last year, I searched high and low in stores and online for a game day dress, the kind you wear with black equestrian boots even though you’ve never ridden a horse a day in your life. Unfortunately, they didn’t make the dresses in my size and trying to zip boots over my apparently enormous calves was like trying to wrestle a greased hog. Virtually impossible. Giving up on the perfect game day dress, I went to a local sporting goods store to at least buy a T-shirt to wear on Saturday to show my team pride as I grocery shopped, got my nails done, visited my Granny Grey, you know, the usual Saturday errands. I bought a 2X t-shirt without trying it on. Of course, it would fit. It looked like it’d be too big for one of the Tide’s linemen. After I mixed up my Rotel dip for the big game that night, I put on my new Bama shirt. For those who have apparently never watched a televised sporting event, Rotel dip is Velveeta cheese, the faker the better, and Rotel, highly processed canned salsa, microwaved together until it melts. It is illegal in most parts of the South to watch football without it and a bag of tortilla chips. Easiest appetizer to please a crowd and raise your cholesterol at the same time. That gray cotton shirt sucked to my fat rolls. Not tight where you stretch it inside out with your arms to give a little extra room, tight like I needed the jaws of life to remove it. I cussed under my breath and threw the thing to the back of my closet. Tonight as I began pulling out all our Crimson Tide paraphernalia decorating the house almost as gaudy as I would for Christmas, I found that t-shirt. My work over the last year had paid off and it fit. Laying off the Rotel dip last season and all the other changes I had made over the last year had proven worthwhile. That t-shirt fitting may not have been a Sugar Bowl win on some folks’ scoreboards but it might as well have been for me. I am going into this football season victorious whether the Tide wins Saturday night or not. Who am I kidding? They play Virginia Tech, a team out of the ACC. Of course, they’ll win. Roll Tide and good luck to all the other SEC teams….except Florida. No self-respecting Tennessean could ever cheer for them. Deuteronomy 20:4 For the Lord your God is he who goes with you to fight for you against your enemies, to give you the victory. Hey I got the 8 foot blow up Big Al for the UT/AL Game!!! Roll Tide is all I can say!!! Go Bama! 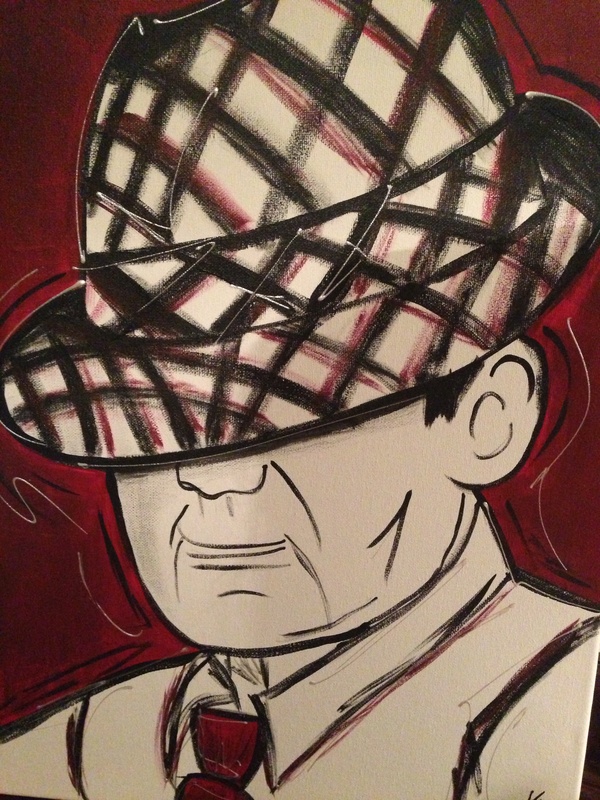 !I I can go toe to toe with Brian on Bama Pride after all I was born in Tuscaloosa! !